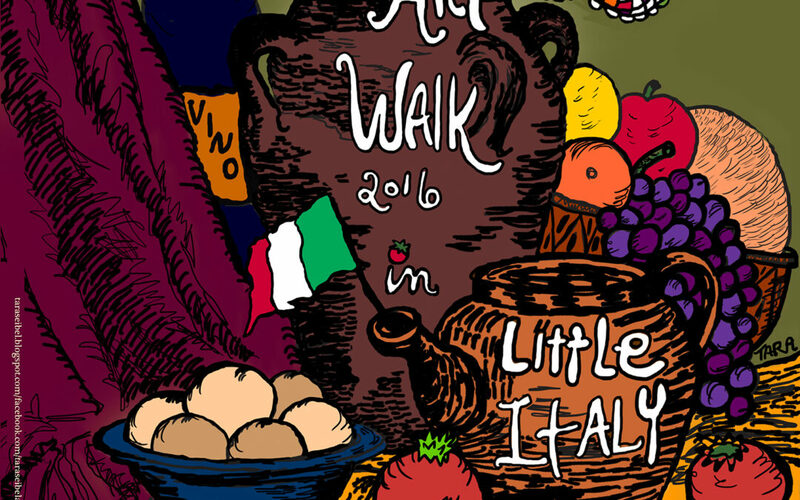 Cleveland, OHIO May 11, 2016– The Little Italy Redevelopment Corporation and Cuyahoga Art & Culture are proud to host the 2016 Summer Art Walk where Culinary Arts Meet the Fine Arts. The event will take place the first weekend in June, beginning Friday June 3 at 5:00 pm. Friday hours are from 5:00-9:00 pm, Saturday June 4 from noon- 9:00 pm, and Sunday June 5 from noon- 6:00 pm. as well as pottery by Mark Nafziger and photography by David Schwartz. Other planned events include a Saturday ice cream social in Tony Brush Park, Barrio Taco’s food truck, Vendor Village, or “Villaggio Artista” featuring local artists including Let’s Face It Caricatures and painter Dani Altieri Marinucci, as well as musical performances from some of the area’s brightest talent. There will be fun for all ages during the three-day art walk, from Little Italy’s fantastic culinary delights to talented artisans and performers. Event committee member David Schwartz says, “We are very excited to have CAC partner with us to strengthen the Little Italy art walks.” He elaborates, “It has been my goal since I joined LIRC and the merchant’s association three years ago to bring the art walks back to the popularly that they carried back in the 1990s and 2000s.” The collaboration with Cuyahoga Arts & Culture allows the Little Italy Redevelopment Corporation to continue to inspire and strengthen the community by utilizing public funding for arts and culture to help build stronger, more resilient arts and culture organizations, creating vibrant and energetic neighborhoods infused with culture, which will establish Cuyahoga County as a hub of creative activity and a destination for artists. Future walks are planned for Notte Biana/White Night Festival in July, the Columbus Day Art Walk in October, and the Holiday Art Walk in December.